1 Use a font from your computer to print 'Joy' onto white paper, then place onto a foam board. Put pins through the paper and foam, around the edge, and wrap a red paper strip around the pins tightly. Wrap and glue the end in place. Repeat for the other letters. 2 Take a 20cm length of pink 3mm wide paper and create a loose, closed coil. Glue the end and pinch to a teardrop shape. Fix to the large bauble. 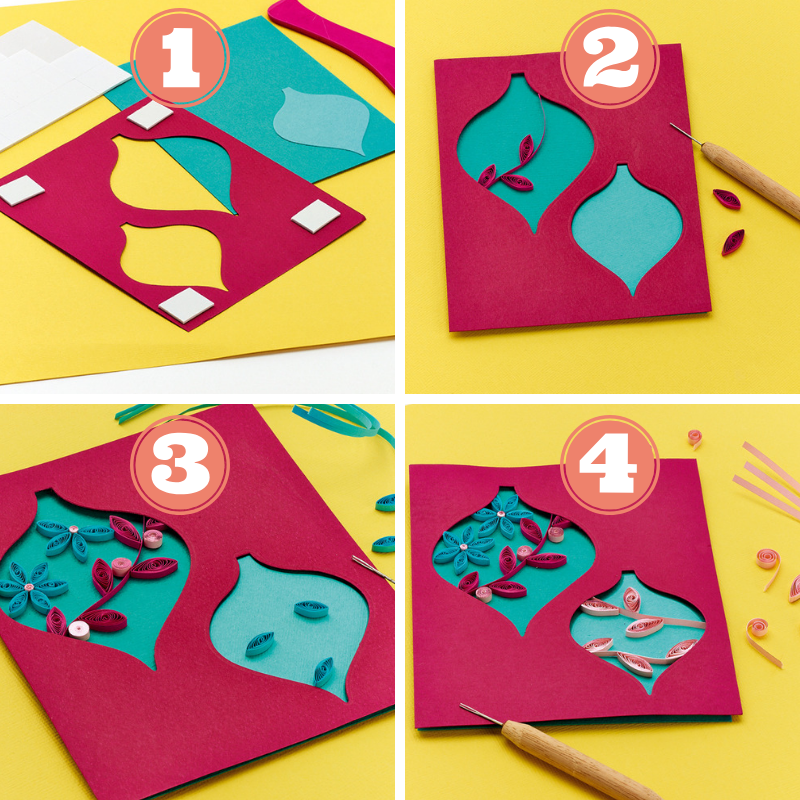 Make five more and glue a strip of paper for a stem in between the shapes. Tuck the coils between the two layers of card. 3 Using a 20cm length of pink metallic-edged paper, make a tight coil. Glue the shape to the bauble, then make two more. For the blue flowers, make a tight coil with a 3cm length of pink, then six teardrop shapes with a 15cm length of light turquoise paper. Glue around the tight coil and make two more flowers. Add three open coils using pink paper. 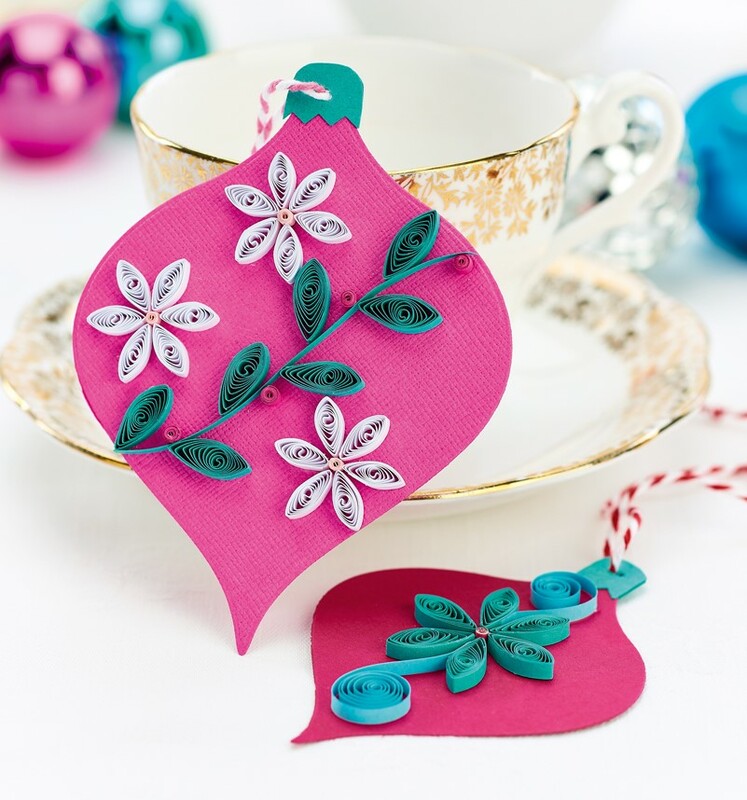 4 For the smaller bauble, use 20cm lengths of metallic-edged pink paper for the teardrop shapes. A tiny flower is made using 5cm lengths of pink for the petals. Using 10cm lengths of pink, make teardrop shapes and glue with open coils at the edges. Wrap twine around each bauble and tie in a knot. Mount to a white blank and add 'Happy Christmas'. 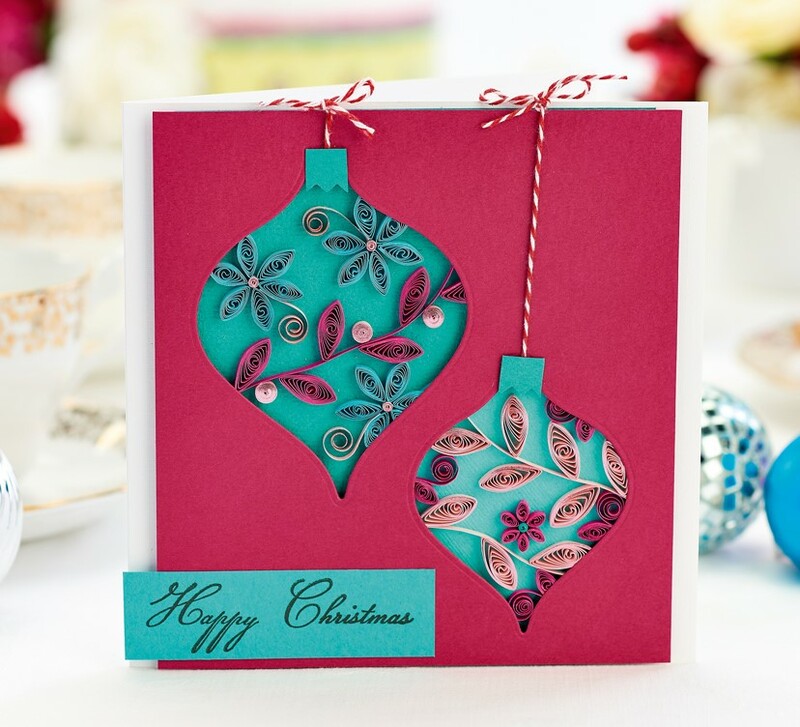 Bold Noel - A large bauble shape is die-cut into pink card then mounted to turquoise card. First, a central sprig of quilled teardrop shapes is made, then turquoise flowers are added. The flowers use two colours of turquoise papers and 20cm lengths for the larger flower and 15cm lengths for the smaller. 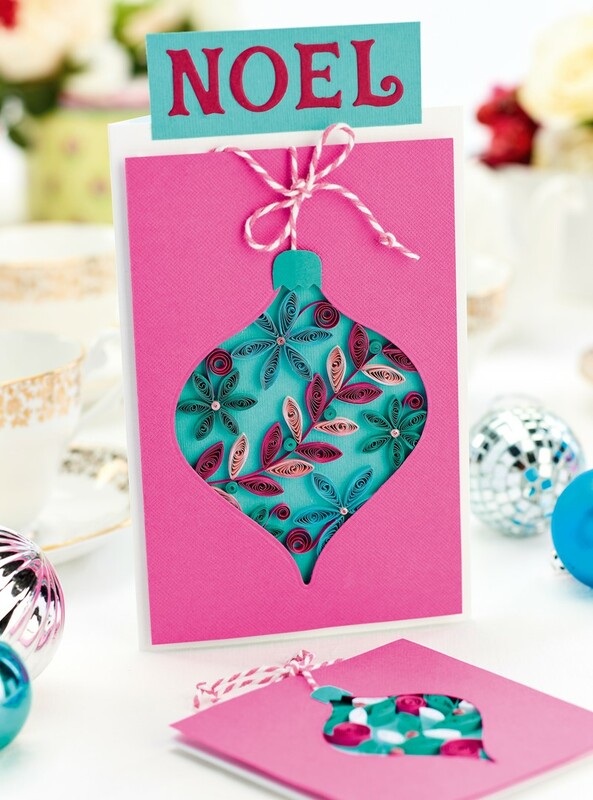 Die-cut 'Noel' from pink card and add to the top of the greeting. Mini Make - For a quick card make a single small bauble using the techniques opposite. Fill the space with quilled shapes and open coils. 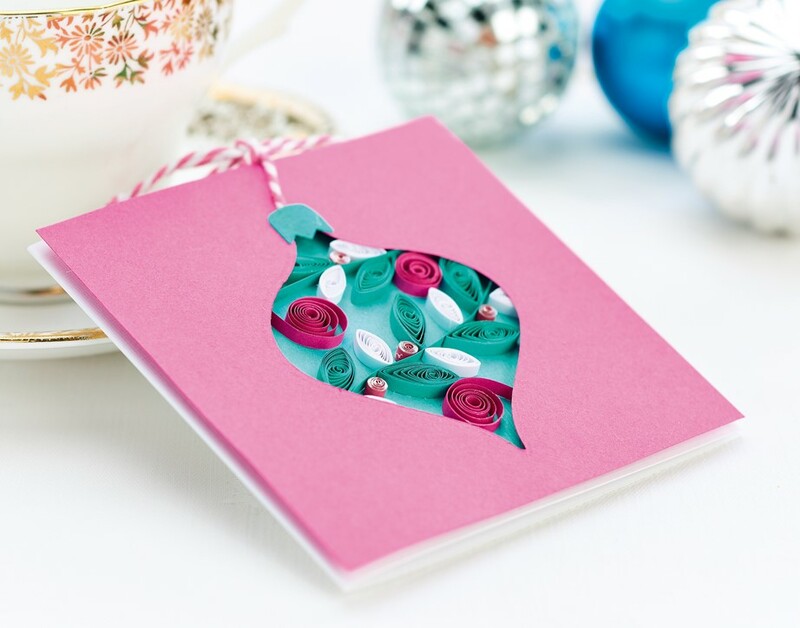 Gift Tags - The baubles cut from the cards above can be used as tags or decorations.